rec. November 2010, Radio Studio DRX, Zürich. 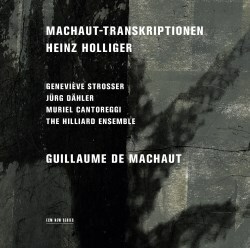 Heinz Holliger’s Machaut-Transkriptionen is a cycle of nine pieces written over an extended period, the vocal pieces of which start out as note for note transcriptions of Machaut’s originals, the works for three violas exploring, adapting, deconstructing, fragmenting and transforming these vocal pieces to create new music. These viola trios can be performed separately or can act as the “dividing line between arrangement and new compositions,” though a large part of the fascination is being able to hear them placed directly against their source. The appearance of The Hilliard Ensemble is a pleasant surprise, recorded here some years before they disbanded. The climax of the entire cycle is reached as the violas and voices unite in a final Complainte. As before, the gauze of mystery lies thickly over the music of Machaut, though the atmosphere and devotional expressiveness is never far beneath the surface, and in fact imbues the music’s whole enigmatic texture. The clustering of notes reminds me of Ligeti at some points, though this music remains mobile within itself, melting and dissolving rather than turbulent: a kind of Machaut lava-lamp in which ancient means of expression mix slowly and randomly while retaining enough of their identity to keep throwing up links between the old and the new. The Epilogue resolves some of the previous complexities in the familiarity of canon technique, the voices turning over on each other as the violas return to the celestial heights of their harmonics. Sublimely recorded and performed with exactly the right kind of ethereal commitment, this is indeed a fascinating meeting between the aesthetics of remote and disparate ages.